Hot, clear, cleansing water. On tap. One of the greatest luxuries we have, a morning rebirth every day, sloughing off the cobwebs of the night – a watery re-awakening into the morning sun. It is the luxury we take most for granted. Showering this morning at 0700, I stopped to relish every second. Knowing it was the last shower for a few days that would be easy, enjoyable, and not filled with concern over accidentally getting my upcoming PICC line wet. First, I anointed my hair with the citrus shampoo purloined from a hotel in Cairo in August 2013, when we went to cover the demonstrations against President Sisi by the Muslim Brotherhood. After the heat of the day had abated – I think it must have been during Ramadan that year – we travelled in the cool of the evening to film the sit-ins at Rabaa and Nahda, talking to families there as the Egyptian security forces prepared to raid them on August 14th. Cairo was a city divided and on edge that summer. But late every night, when the filming was done and our reports had been filed, I still remember the bliss of the shower in the hotel on the island in the centre of Cairo. I remember too the unspoken relief we each savoured when we returned to the hotel safely every night after filming at demonstrations that were rapidly turning into a brutal contest of wills between protesters and the government. With the water cascading down, the cleansing droplets caressing every inch of me, sloughing off the dust and demonstrations of the day, I could finally shut my eyes and just be, living in that moment of corporeal bliss, all thoughts and analysis suspended in this watery heaven. When I shut my eyes in this morning’s shower, holding on to the handrail to steady myself, I thought of another shower. The best one I’ve ever had in my 49 and three quarter years on this earth. It was in Kuwait in 2003, again in May, I think, although my memory is unreliable on dates. I do remember it was at sunset on the day we ended our embed covering the invasion of Iraq. For several weeks, my colleagues and I had lived and worked in a British military camp in the desert known as the FPIC. The Forward Press Information Centre. The only two words in that acryonym that bore any resemblance to the reality were press and centre. There were a lot of journalists; most, the hardy veterans of many wars across many continents. And, perhaps surprisingly for some, a lot of them were women. Rachel and Sarah Corp from ITN and Channel 4 – two feisty sisters who feared nothing. Our camerawoman, Julie Ritson – the best woman to have by your side in any tricky situation, anywhere from Basra, to Helmand or even Chechnya and Vladivostock. 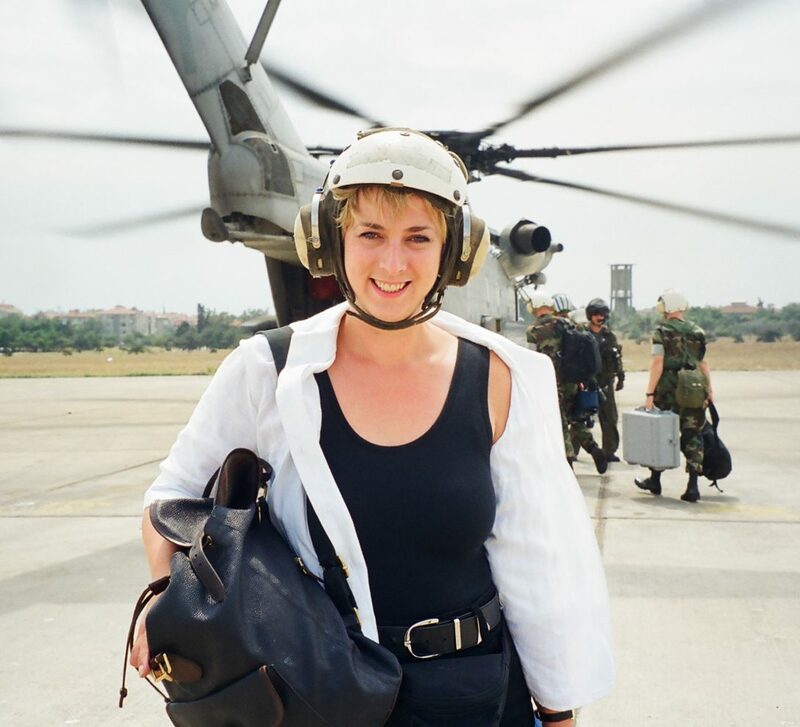 And my BBC correspondent colleagues: Hilary Andersson, a generous soul as well as a ferocious seeker of the truth behind every story, whose dry sense of humour never failed to make me smile. Not forgetting Kylie Morris, whose Aussie sunshine smile and fund of jokes never stopped. Of information, there was little. And forward? Well, perhaps we were a little closer to Basra than some of the other embeds, but the idea that this was any hub of information proved far from the reality. Official information was patchy, occasional and usually only half the story, if that. Reading between the lines became a skill we practised ruthlessly every day, several times a day. Our minders – most of them reservist volunteers – were enthusiastic, kind-hearted and did their best to wrangle this unruly cadre of correspondents and others into some kind of organised corps, who’d report what they were told. They failed on a daily basis, but the battle of wits was fun. Then there was the border guard who didn’t want to let us out of Kuwait. I think our paperwork was not in proper order, and if you are a border guard, these things count. After a brief stop, to persuade him there would be less paperwork if he simple let us through, we continued to our sandy new home in the desert. For several weeks, my BBC colleague Hilary Andersson and I split our reporting duties, so that at least one of us could leave the camp each day to find out a little more about what was really happening ‘on the ground’. But all we could know for certain was what we’d seen with our own eyes and could verify. And some days, that was precious little. People talk of the fog of war. We tasted the dust of war: sandstorms so ferocious that they reduced our visibility to a matter of inches, and turned the desert around us into a howling yellowy-orange void. Our small tents would be battered and filled with fine grains of that sand that got into every crevice. One day, as Iraqi forces bombarded a position near us, I was sitting in the sunshine in one of the open-top wooden latrines, trousers around my ankles, pondering what the day might bring. Suddenly, a bang in the distance, and the cry of “gas, gas, gas” went up – the signal to put on our masks, in case the shells landing wherever they pleased contained biological or chemical weapons. I was paralysed with a moment’s indecision. Should I pull my trousers up first and preserve my dignity, or reach for the gas mask that hung from my belt and save my life? It seems an easy decision in hindsight, but at the time it was not. Dignity is heavily ingrained – and what would my mother think if I’d run through the camp half-dressed? But sense prevailed. Gas mask first, then trousers. And a heart-shattering run to the relative safety of the bunker that we’d helped to build the week before. Sitting panting from my exertion, the adrenalin beginning to subside now I was safely in the bunker, or so I thought, I could feel my eyes welling up. My nose began to run. Involuntary tears streamed down my face. Had I been gassed? No, everyone else looked just fine. Perhaps I’d been closer to the explosion? No, everyone else still looked fine – if a little silly in our camouflage tops and black gas masks, for all the world like a Berlin S & M party that had somehow got lost in the desert. For a few panic-stricken moments, I thought that I had been gassed and might just die. And then, just as suddenly, I realised with a chemical surge of relief throughout my body that some tiny particles of tear gas – used in our training – had still been lodged in my mask. My heart rate began to slow, and all I could do was laugh, shaking silently at my own stupidity in not properly cleaning out my mask. There were many other days, and many other stories from the desert in those weeks: the hopes that the people of Basra had pinned on British troops in the early days. The souring of their warm initial welcome. The dead young Iraqi man whose body lay just outside our camp one morning, that even the gentle afternoon heat could not revive, his name and story unknown. The day that Basra fell or was liberated, and we got lost in the desert because our (British) military driver couldn’t read a map, and instead drove straight towards an insurgent checkpoint as we shouted at him to turn back. But of all the things that stay the most vividly with me to today, it is the bliss of the shower in that Kuwait hotel room after weeks of grime and dirt – a carnal bliss that I can still feel if I close my eyes. As the endless hot clean water cascaded down, the sand that had lodged in every crevice of my being gradually started to loosen and slide towards the shower floor, until the smooth white enamel resembled a mini-desert of its own, sand lapping against the sides of the cubicle in drifts. For ten or even fifteen minutes I stood beneath the water, sloughing off both the war and the sand. Never before and never since has the simple act of washing felt so good. We had had our solar showers in the desert – hot water bottles hung up high, that dribbled their precious liquid over your shoulders in miserly drops, but did little to actually clean. This was the first time I had been truly clean for so many days that I’d lost count. And as I reluctantly emerged and turned off the tap, I sat on my bed in a white fluffy towel for thirty full long minutes, my body and brain numb with gratitude and bliss. I was alive and in one piece. And best of all, I was alive and clean. That gratitude, for all the things we usually take for granted, came back to me today. This morning’s shower was the last for a few good days that was uncomplicated, blissful and a pure physical delight, with no PICC line attached to my chest. My worries about its insertion were not necessary. The doctor, Juan Miguel, I think I heard him say through the comfortable haze of drugs provided by Erik the anaesthetist, was quick and adept. His warm brown eyes above his surgical mask inspired confidence and trust. I didn’t even feel the line go in, perhaps a mere twenty minutes after he drew a confident black dot just beneath my collar-bone to show me where it would be. Efficient kindly porters had practised the knack of rolling their patients from one bed, across a metal barrier, with someone to catch and settle you gently on the other side into the area before surgery. Behind his own blue surgical mask, Gustavo introduced himself as he helped wheel me into the operating theatre, the white lights passing above me as I lay on my trolley. If this was passing through from our everyday world to the underworld of anaesthesia, it was a blissfully painless ride, and the Hospital Puebla a very welcoming place (with valet parking only costing a few pesos, as was made clear at the entrance). In Greek mythology, when your soul passes from this world and reaches the River Styx, the boatman Charon would give you a ride to the underworld. But that ride was not free. If your family had not buried you with a coin to pay the boatman, you might find yourself stuck. Luckily, my borrowed coins had been sent on to Mexico some weeks in advance, so all was well. In my addled, anaesthetised mind, as the lights of the operating theatre dimmed and vivid visions took their place, I crossed over into a twilight world of dreams, as Greek myths filled my thoughts. For those who received their ride in Charon’s boat, there was little to do on the other side apart from wait to be reborn. A new body would await. And these souls would not remember their previous life, nor its pains and hardships. They would simply start again, as a new-born infant back in the real world above. A few dreaming hours later, I woke up with a start in hospital room 203, painted the colour of sunshine. My shoulders hurt, although the PICC line created no pain at all. I felt sick, and dehydrated from the hours spent with no water and no food, and reached greedily for a snack. Bad idea. A pang of nausea hit my stomach, and a migraine began its ominous drumbeat in my head. Water first and then food. And then a brief drive back to the flat in the January sun, and back to my refuge – my bed, solid in the swelling sea of nausea, to watch the sun set over Popocatapetl, burnishing the clouds. A flock of what might be swallows formed a cavalcade, nodding to me with a fly-past by my window, a swarming together through the air in the miracle of flight. In three days time, we punctured patients here shall be reborn. First, though, will come tomorrow’s stem cell harvest. Another shot of filgrastim tonight to stimulate the tiny cells to grow. A long morning’s harvest lies ahead, the millions of stem cells encouraged out through the PICC line so carefully inserted today. Perhaps Demeter, the Greek goddess of the harvest, will be watching us here in this grain-filled, fertile land. And then another round of chemo, and on Friday yet another, before Saturday brings rebirth. My shoulders still hurt, and my fingers are aching tonight. The light has gone outside, and Popacatapetl sleeps in darkness, and soon so shall I, if I can settle with the PICC line emerging rudely from my breastbone. But in just a few days’ time, we hope we shall all return from the darkness and the twilight kingdom of the sick. And when and if we are better again, in a few months or a few years, will we still remember and be grateful for this journey through the underworld, as we step back into the light?